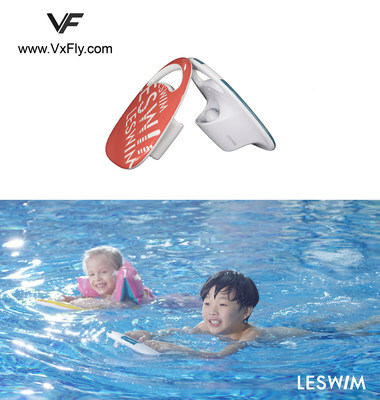 LAS VEGAS -- At CES 2019, Shenzhen VxFly launched LESWIM, an electric kickboard that can provide both buoyancy and propulsion. This new comer to the swimming gear family will bring a totally new swimming experience. LESWIM helps swimmers of all skill levels to glide through the water. Henry He, co-founder and CEO of VxFly, says: "We want to change the way people learn to swim, help them overcome their fear of water, inspire their interest and build their confidence. And we want everybody to enjoy it, so we designed LESWIM to be affordable and easy to use." Designed for children and adults, LESWIM is both easy to carry and easy to use. Users just need to hold the two ergonomic buttons simultaneously to start it, and release them to stop. Weighing only 2.6kg, LESWIM can easily fit into a backpack. With a mild force propeller, LESWIM provides 4kgf and moves at a speed of 1m/s. At this comfortable speed, both the user and their surroundings are safe from harm. Different from the monotonous look of traditional kickboards, LESWIM looks more fashionable. There's several panel patterns to choose from--simple strap, lovely cartoon, modern art, etc. Featuring magnetic attractors, the specially formulated plastic panel can be easily replaced. The battery of LESWIM is rechargeable and easy to swap. Moreover, the battery is sealed in a waterproof housing to ensure the electrodes are well protected from water. To protect children, two engine grilles are installed in the front and at the back of a deeply indented propeller. The propeller generates noise lower than 50 dB, so as to not cause any disturbances during use. There's also a GoPro mount, allowing users to capture memorable underwater moments to share with their friends and family. The price of LESWIM is also quite attractive and competitive. The retail price is set at USD 199.9, which is much cheaper than similar products on the market. For those who want fast speed, VxFly will also soon launch a Sport version with dual propellers and more powerful propulsion. For additional information, please visit www.VxFly.com or contact marketing@vxfly.com. Shenzhen VxFly Intelligent Information Technology Co., Ltd is a global innovation leader focusing on marine science and technology, and has launched consumer, professional and enterprise level underwater robots. VxFly has received more than 41 patents and 29 trademarks, and has over 100 business partners in 40+ countries.